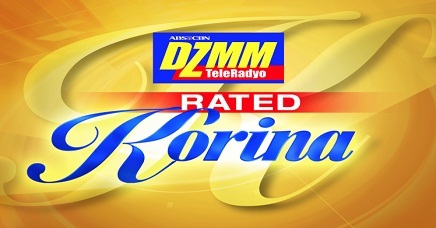 Veteran broadcast journalist Korina Sanchez has resigned from her DZMM radio show Rated Korina, ABS-CBN executive Eric John Salut confirmed over the weekend via Twitter. In the same post, Salut added that Sanchez will remain anchoring the news porgram TV Patrol and her weekly magazine show Rated K. She will also remain as ABS-CBN’s chief correspondent. Sanchez’ previous time slot will now be occupied by “Sakto,” to be hosted by Marc Logan and Amy Perez. To preempt speculations from the public, Sanchez promptly released a statement saying that her desire to focus more on her graduate studies from the Ateneo de Manila University is the reason behind her exit. “Muntik na akong ibagsak ng dalawa kong propesor dahil sa absence at late submissions kaya talagang hindi ko mapagsabay,” Sanchez said. Anyone out there who is juggling work with the requirements of a master’s program definitely agrees with her, including this writer. However, there’s definitely more to this than what they’re saying in public. Sanchez has been part of DZMM’s morning block for over a decade now, with news and commentary shows like ‘Korina sa Umaga‘ and ‘Tambalang Failon and Sanchez.’ However, her longtime relationship and eventual marriage to Mar Roxas in 2009 directly affected perceptions of how she is handling her job. As noted in a previous post here, Sanchez has for years been accused of turning her position into a platform by which to attack her husband’s political rivals. On separate occasions, Sanchez was said to have attacked Inquirer columnist Conrado de Quiros, ABS-CBN reporter RG Cruz, and Vice President Jejomar Binay. In fact, some suggested that Sanchez’ series of investigative reports in 2008 about glutathione whitening products was really all about ruining the presidential prospects of Senator Loren Legarda, a one-time endorser of Lucida-DS. In short, Sanchez’ role in ABS-CBN News has long been problematic. What appears to be the straw that broke the camel’s back in this case is Sanchez’ offhand criticism of CNN’s Anderson Cooper at the height of the relief efforts for the survivors of super typhoon Yolanda last November. During a live report, the American journalist noted that there’s ‘no organized relief effort’ from the government. “Hindi yata niya alam ang sinasabi niya (He’s not really aware of what’s happening on the ground),” Sanchez said of Cooper through her commentary program last November 13. Cooper’s observation must have hit a raw nerve for Sanchez. After all, her husband was the designated point man of the administration for the relief efforts at that time (ex-Senator Panfilo Lacson has since been appointed the rehabilitation czar). The top honchos at ABS-CBN for sure knows that with Roxas now being positioned for the 2016 presidential elections, Sanchez’ active role in the news department is becoming less and less tenable. The official campaign period may still be two years away, but expect the candidates to begin campaigning in earnest by mid-2015 at the latest. In other words, expect Sanchez to leave TV Patrol within the next year and a half or even earlier.